A prosecutor told jurors Tuesday that a man “terrorized and robbed” a mother-to-be in the victim’s Pacific Beach apartment, while a defense attorney said his client entered the woman’s unit on accident while in the midst of a drug and alcohol-fueled haze and has no memory of doing so. James Lee Graham, 41, is charged with robbery, burglary, false imprisonment and resisting arrest in connection with the Dec. 14, 2017, robbery. The victim was seven months pregnant at the time of the home invasion, according to the prosecution. 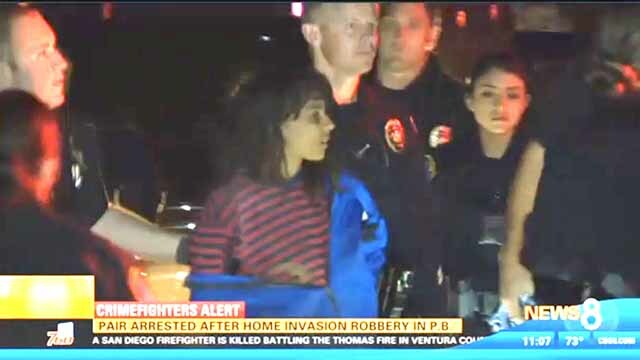 Graham’s alleged accomplice, Stephanie Majsterski, 26, pleaded guilty last year to burglary, false imprisonment and vehicle theft for taking part in the robbery, then stealing a San Diego police cruiser while fleeing the robbery scene and driving the SUV into the water at Fiesta Island. She was sentenced to five years in prison last September. Deputy District Attorney Lucy Yturralde said Graham and Majsterski entered the woman’s third-story apartment about 9 p.m. when the victim’s husband left to go the laundry room on the first floor of the complex, leaving the apartment door shut, but unlocked. Upon entering, Graham asked the victim for money and her car, while gesturing with his hand inside his jacket sleeve, as though concealing a knife, while Majsterski blocked the door, the prosecutor alleged. The victim told Graham that she did not have any money or a car, but said he could take whatever items were present in the apartment, according to Yturralde. Those items, which included two laptops, a cell phone and a wallet, were found strewn along the area where Graham was eventually found and arrested, she said. More of the victims’ items were found inside a backpack Graham was carrying, the prosecutor said. Graham’s attorney, Denis Lainez, said his client and Majsterski went to the apartment complex to meet another person who lived on the third floor, but wandered into the victim’s unit by mistake. Lainez said Graham was under the influence of methamphetamine and had consumed “an entire bottle of vodka” prior to arriving at the apartment complex. Lainez conceded that once inside the apartment, Graham did take some items, but maintained that he never threatened or touched the woman. In addition to intoxication, Lainez said Graham suffered from an undiagnosed bipolar disorder and was homeless at the time. Graham “simply doesn’t remember doing this” due to his level of intoxication, his attorney said. Yturralde said there was no indication that the defendant was under the influence. “At the end of the trial, you’ll see that the only reason he did (the robbery) was because he wanted to,” she said. Both defendants fled the apartment on foot, but split up, authorities said. Graham was quickly arrested, while Majsterski briefly absconded with the police SUV into the water. She was arrested a short time later as she tried to sneak off the island as a passenger in another car. Graham, who has numerous robbery convictions dating back to 2008, was on parole at the time of the Pacific Beach robbery and faces more than 55 years to life in prison if convicted.